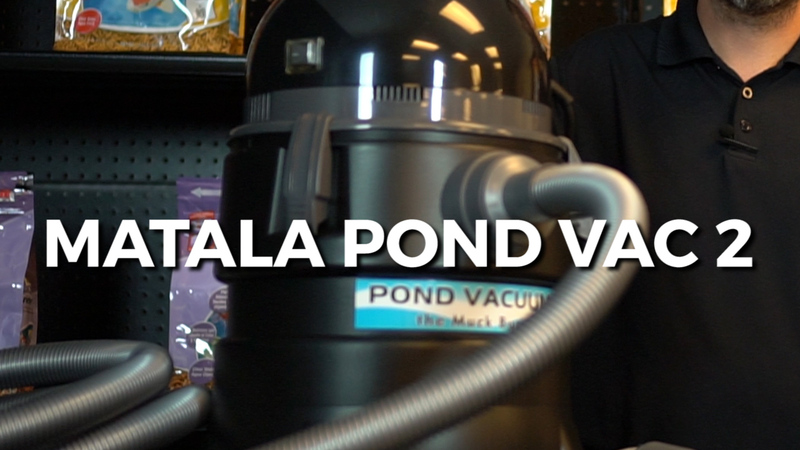 Matala Pond Vac II Review This vacuum is a workhorse, but will require a small amount of patience due to an auto fill and drain cycle, or on/off cycle. This on/off cycle allows for the vacuum canister to fill, then discharge. The cycle is approximately 40 seconds vacuum and 20 seconds drain out. During operation, the canister tank fills and a small float rises – similar to a shop vac. Once it’s full, this float triggers the motor to turn off automatically. The waste water will start to empty out the drain hose. When the canister is empty, the motor turns back on automatically and continues to vacuum. Use the optional mesh bag to capture large debris before it releases onto your property. The dirty pond water is an unbelievable fertilizer for your garden plants – don’t let it go to waste. When operating, it’s important to note the vacuum must be elevated above the pond and the drain hose positioned below the bottom of the tank – this will ensure proper drain out. Comes standard with 3 adjustable nozzles, multiple extension tubes, a 16 foot suction hose, a debris collection bag, and a 8 foot drain hose. The holding tank has a capacity of about 4.5 gallons. For additional information on the Matala Pond Vac II, please do not hesitate to call. I’m Joe from Webbsonline. If you choose to run your pump during the winter, and it's powering a waterfall, it's important to monitor for ice dams. These are ice accumulations that can occur at the base of your waterfall during freezing conditions. The chart in this article is to be used as a guide in diagnosing fish disease. Do not use this information as professional advice. If in doubt, please consult a professional. Please follow all directions on medications exactly as instructed on product.